Green Mountain Garlic is located in Waterbury, VT.
Over the years Green Mountain Garlic evolved from a home garden, to a small test patch planted next to a mountain stream, to a family farm with acres of seed garlic and a new barn built specifically for drying and storing. 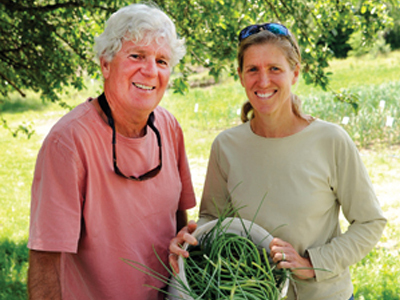 Green Mountain Garlic is dedicated to practicing sustainable agriculture and are constantly working to maintain a rich, healthy soil through the use of cover crops, crop rotation, composting, and natural soil amendments. They are certified by Vermont Organic Farmers Association. We welcome Green Mountain into our network of local growers and suppliers!